Sorry.. where does one see this "Killer Beast"? That's interesting. Where'd you find it? It's certainly not in the "game"... or is it just that I don't have ANY "frags for him? I've searched the forums and the ONLY mention of Killer Beast are from you directly. So do you have special access or something? Or are you troopers with a dev.. and the dev's playing him? That ability in particular just makes Eternity talismans less necessary and kind of matches Crusader's Fury. 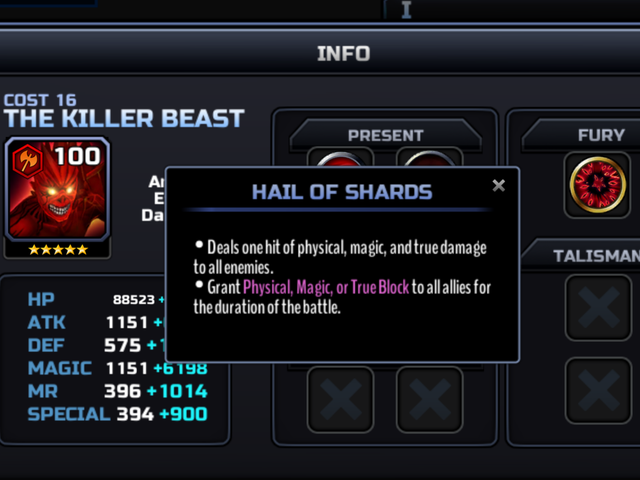 Not better than KP's passive to me. Last edited by Yup; 02-05-2019 at 10:11 PM. Oh .Sorry I am.. an idiot........ just goes to show how LITTLE I care about Night City Played through it once and that was it. No reason to go back. So you're just speculating he'll be released then. Okay. That does make sense due to Killer/KP being released. I'd still go with KP though. I'm not generally a fan of character with a fury.. some are useful with some Eddies, but as of yet, for PvP, those combinations are a non-starter for me. The AI tends to use the character fury far more than the Eddie fury. I put up with The Alchemist having a fury due to his other abilities, but I wish he had a passive rather than a fury. But who knows maybe KB/Alex Ed or KB/Shogun or KB/Shadow Wicker will change things. Last edited by Yup; 02-05-2019 at 10:23 PM. KP may just be better simply cause of his devastating passive, plus the great healing he provides with bloodlust. KB's Blood Bath does seem super fun as well but the fury is a tad underwhelming considering the existance of Valor talismans, FFE and other things that could dispose of the shields easily. KB's power ability seems a little better than KP's though since the randomness of Banish doesn't really do it for me. Finally, KP would IMO work better on autoplay because of him being able to grant perfect hit status. Still very looking forward to trying to obtain KB. i think that Killer Beast will be available in "new event soul" and will not be possible to buy him with blood fragments because blood fragment items in store will disappear after 3/3 night city end,that's logic?